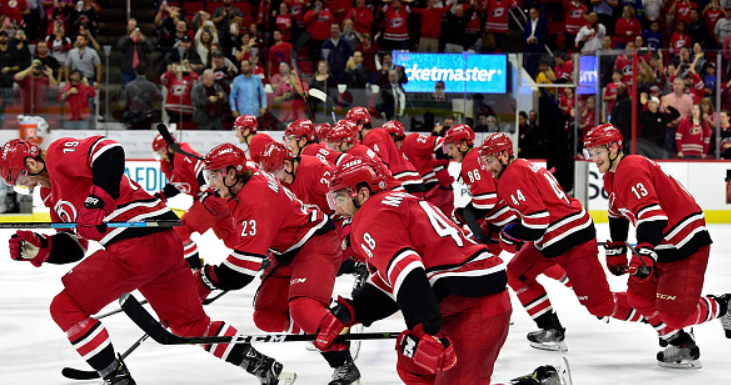 People are getting all kerfuffled over the Carolina Hurricanes’ unique twist on post-game fan appreciation tributes. ESPN, which doesn’t even cover hockey so’s you’d notice, deemed this story important enough to commission a piece by Greg Wyshynski titled, “Inside the Hurricanes’ wild new postgame celebration,” as if it was a carefully orchestrated campaign of a President’s Cup-winner, rather than a quirky bit of fun at the end of a nothing game. I have to assume ESPN’s hockey editor — if there ever were such a person — had their tongue firmly in cheek when slapping this title on because pretending there was any “inside” to this “wild” celly is like pretending there’s an “inside” to your basic round donut. There was only an “outside” and it offered none of the mystery or intrigue suggested by this article. A slow clap, a skate to the end boards, a little hop up against the dasher and in a few cases, the lower glass. If we set about using words like “wild” in this case, I don’t know what we have left for animals that live in the mountains, Thornberrys, fires, and that untended child next door — not to mention goose chases. I can only think Wyshynski is using “wild” in manner he associates with Minnesota’s NHL franchise. In which case, I see the resemblance. Wyshynski began by putting this crazy and reckless celebration in context, juxtaposing it with the usual center ice stick-raising salute, which he aptly called “perfunctory.” But then he went on to refer to the end-board jump by the ‘Canes as “hilarious”. I can’t imagine that Wyshynski doubled over in laughter when he saw this celebration. It was mildly amusing, but hilarious is far down the block, attending a whole ‘nother hootenanny. In short, this celebration was important, but it was about as “wild” and “hilarious” as Ovechkin taking an All-Star game shoot-out in sunglasses and hat. Much has been written on this post-game oddity: some have called it “corny,” and most have called it “fun.” As you can see from ESPN’s treatment, it instantly rose to the level of a coordinated and planned event; NHL.com even had the temerity to write that the Hurricanes “debuted” it, as if to rival Gritty, who actually debuted — for better or worse. But what I can’t find — what virtually nobody is writing or saying — is the real reason this celebration matters. And it has nothing at all to do with what they did — how slow their clap was, how it was or was not timed with the PA announcer’s yammering, how fast they skated, how wide their smiles, how high their leap into the glass or how “rebranded” they all were when they left the ice. It has everything to do with what led up to it. Wyshynski reports that Williams said the idea arose “from discussions with management to do something that would be distinct while reinforcing the fun factor in Carolina this season.” Well, given that you’re a hockey player, you come out for warm-ups, you go back in, you come out to play the game, and then go back in. The times for something “distinct” are pretty limited unless you plan to lie down on the ice en masse during a power play and do snow angels, flapping your arms in time to “Sweet Caroline.” What’s left is the post-game, and even among the best fan bases, not everyone stays for it. Williams added in these discussions that it might be something to entice the crowd from leaving the arena early. O.k. If crowd attendance through and past the final buzzer is at the top of your list in turning a franchise in the right direction, who am I to question it? It’s a place to start, after all. And to be clear, I don’t fault Williams in any way; he’s doing what he can with what he’s got. But did I mention that none of this matters because it’s about what led up to it? Like any action, invariably there was thought that presaged it. And in this case, that probably started with Justin Williams as much as with management. I know people like Williams — veterans in their field, capable of great things, who get to the point that they don’t like what’s going on; they’re tired of feeling like they are less than what they could be and they want to be part of something greater. It’s why they do everything they do. Their lives are governed by purpose. This guy is a three-time Stanley Cup winner with two different teams. He would have had a fourth if only . . . Well, no matter. Point being, Williams isn’t going to settle for mediocrity if he can help it, at any age. But that’s only part of the story. When any professional who is part of an organization takes the step of having conversations with management about such things — team unity, customer awareness, chemistry, bonding, excitement, or simply progress — it’s because they’ve first thought about it deeply and earnestly on their own. They’ve already made their own decision to go all in, to commit to the endeavor, to help define its focus and tone, to help engage others and promote a culture, an attitude and a goal. They care about what happens and they have decided to be part of the solution. All of these things are evident by watching a Justin Williams stand slightly apart but on the line with his team and raise his arms to start the slow clap that the rest joined in. And of course the skate and leap. I haven’t the slightest issue with this celebration; in fact, I think it’s terrific. I do take issue with the hockey media for debasing it by labeling it merely entertainment, commandeering it for clicks, ignoring what it really meant and reducing it to a “wild” or “hilarious” antic by — golly gee — a young and plucky hockey sideshow. No, this was a much more thoughtful and deliberate action, part of a process that began with introspection by number 14. If Williams’ teammates follow his lead more than they follow mainstream hockey media, they might just have something special. Previous Post: Is It Time for “Jumbo Joe” Thornton to Take a Knee?